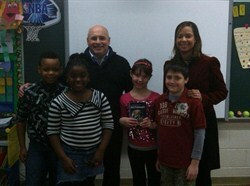 Mayor Cicero Makes Special Presentation at Sunview! Sunview Elementary School was paid a very special visit by Lyndhurst Mayor Joseph M. Cicero, who delivered to the third grade classes a very thoughtful gift of academic enrichment. The Mayor visited Sunview to personally present 86 dictionaries on behalf of the Rotary Club of the City of Lyndhurst, to which he is a member. According to Mayor Cicero, such an act of generosity helps to fulfill a meaningful core value of the Rotary Club, which upholds ‘service beyond self,’ at all levels of outreach, including local, national and global. Mayor Cicero presented no ordinary dictionaries, however, but rather comprehensive ones, which included such resources as sign language protocols, information on US Presidents, the Periodic Table of the Elements and more! Sunview Elementary School and the South Euclid Lyndhurst Schools thanks Mayor Joseph M. Cicero as well as the Rotary Club!